It was a surprisingly easy commute for people who had to drive on or around the San Mateo Bridge. Caltrans was forced to shut down one lane of the bridge to do emergency repairs on a cracked steel beam beneath the bridge. The crack was discovered during a normally scheduled bridge inspection Tuesday. The beam in question is on the westbound side and below the lane closest to the water. It's located just prior to the elevated portion of the bridge and was installed nine years ago as part of a seismic retrofit. The crack is described as ten inches long. The fix is expected to take 24 to 48 hours and began Wednesday night. By Thursday afternoon, Caltrans was saying that they thought the repairs would continue through Friday. The press release said "completely possibly as early as Friday," so it would be good to prepare for more delays in the morning. Caltrans was able to give drivers warning of the closure and that seemed help the Thursday morning commute back up. NBC Bay Area's Mike Inouye reported a lighter than usual volume for a typical Thursday. 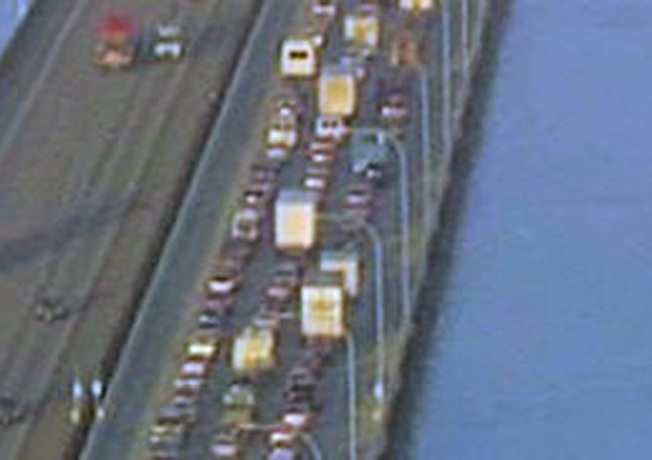 By 9 a.m. traffic was only backed up as drivers approached the highrise at the county line. Caltrans says once they fix the crack, they will try to figure out what caused the crack in the first place.